Part One: Who are advocates and why they matter. Brand advocates are hot and trending—again. Conversation about brand advocates and their business value is buzzing, because we have more collective experience under our belts. Advocate programs are beyond the proof of concept stage. 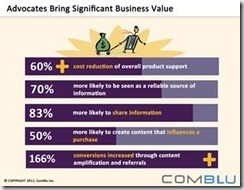 There are real metrics available to us that quantify the business impact that advocates yield. Maker’s Mark (and their ambassador program) is a great example of an early adopter that has been running an advocate program for years. Whirlpool and Mom Central launched a pilot program in July and recently presented the results at WOMM-U earlier this month. The risk finally outweighs the reward. So what have we learned about this small but powerful group of brand fans? 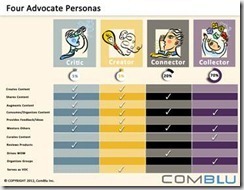 Our infographic helps visualize who advocates are and why they matter. 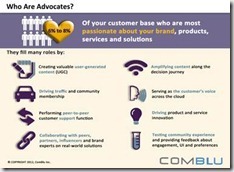 First, the “who.” Advocates make up just six to eight percent of your customer base. But, remember you can do a lot with a few. A relatively small group of engaged advocates can have enormous impact on the business.Advocates can play multiple roles. Most importantly they are the new voice of the brand. They love and defend you, because you market with them and not to them. Be prepared to have a genuine relationship with your advocates. It will pay dividends. Not all advocates are created equal. Your business mission will determine the right type of advocates to identify and recruit for your program. 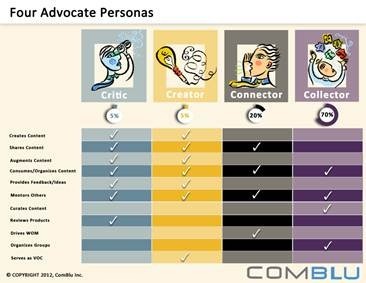 It is important to understand which advocate segments will activate for what program, and how to engage with them in a meaningful way. 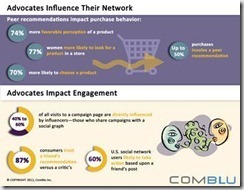 Brand advocates are the go to person for purchase advice from peers. Unless you have been living under a rock, everyone knows that today’s consumer trusts the recommendation of someone they don’t even know. It is all about the social graph. You are not engaging with an individual—you are engaging with a network. 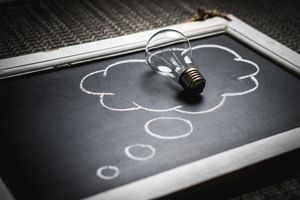 So now that we get the who and the why, let’s focus on the “how.” There is a lot to get your arms around, so it is important to take a process approach from the beginning. First, start with your key business objectives and define the mission of your advocate. You need to know what you want them to do first. Next, you need to identify the right type of advocate for that mission. Start by leveraging social listening tools like Sysomos to drive your recruitment—this will help you find passionate fans already creating and sharing content outside of your own social ecosystem. 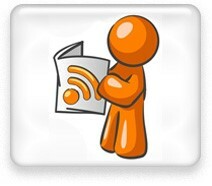 Down the road, listening will also inform your engagement, messaging and content strategies. You will also want to tap into your owned assets—best practice is to fish in your own pond. How will you use your existing infrastructure to reach loyal customers? In those upcoming blogs, we’ll share some brand examples we think epitomize best practices in advocate deployment. 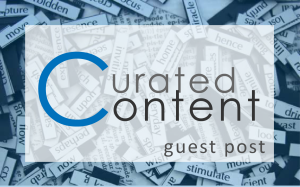 In the meantime, if you have any great case studies or innovative brand advocate programs to share, please do!